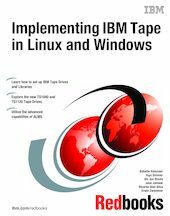 This IBM Redbooks publication follows IBM TotalStorage Tape Libraries Guide for Open Systems, SG24-5946, and will help you plan, install, and configure IBM Ultrium LTO tape drives, as well as the IBM TS1120 and 3592 tape drive and libraries with servers running Linux and Windows. This book focuses on the setup and customization of these drives and libraries in both direct-attached SCSI and SAN configurations. Part 1 describes how to attach and configure the drives and libraries, and covers basic installation and administration. It also covers the sharing and partitioning of libraries and explains the concept and usage of the Advanced Library Management System (ALMS) and virtual I/O with the IBM TotalStorage 3584 Tape Library. Part 2 documents how to use these products with popular data backup applications, including IBM Tivoli Storage Manager, BakBone NetVault, Arkeia, and EMC Legato NetWorker. This book will help IBM personnel, Business Partners, and clients to better understand and implement the IBM Ultrium LTO product line and also the IBM TS1120 and 3592 tape drives in Windows and Linux environments.